TYSON Fury made a winning comeback to boxing after more than two-and-a-half years out of the ring after opponent Sefer Seferi quit on his stool at the end of four rounds in Manchester on Saturday. 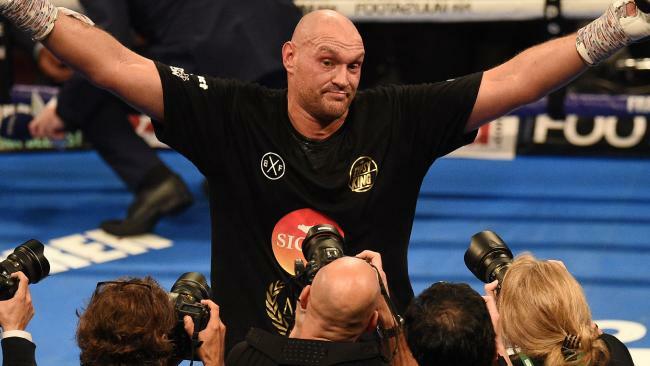 Former heavyweight champion Fury had not fought since dethroning Ukrainian Wladimir Klitschko in 2015 and suffered various drug, alcohol and mental health issues since then. And the clearly overmatched and undersized Seferi -- a career cruiserweight -- could only handle his giant opponent for four rounds before his corner threw in the towel. Seferi was seven inches shorter and nearly five stones lighter than Fury, who used his reach and height to ensure there was never any danger of an upset. "I'll have a world title by the end of the year," Fury said post-fight. "I learnt two and a half years is a long time, a thousand days, and I'm just very happy to be back. "I will take my career very seriously this time, and not take anything for granted, and enjoy every moment." But fight fans were understandably left wanting more; many viewing the bout as a complete mismatch. Tyson Fury was always going to be rusty, and a bit chubby around the waist. The issue was putting him up against a cruiserweight with such a weight, height and reach disadvantage - this was never going to be a decent watch but somehow managed to be worse than I expected. Tyson Fury has landed more kisses than punches tonight.